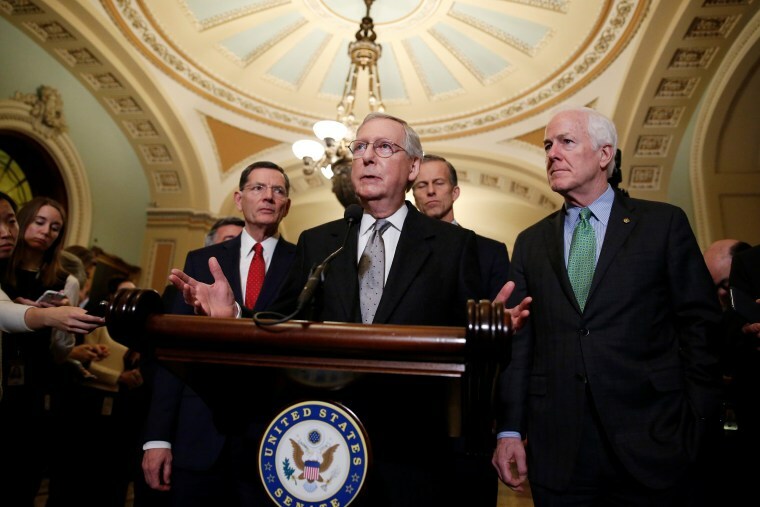 Leigh Ann Caldwell looks at how GOP candidates who bash Mitch McConnell aren’t necessarily seeing it pay off. Democrats are pointing to their lack of damaging primaries as a strength, writes Paul Kane. Republican gerrymandering might backfire for the GOP this year, POLITICO reports. More brutal primaries are looming for the Republican Party. Mike Pence is planning a joint fundraiser in Indianapolis for Josh Hawley and Mike Braun, the Washington Examiner reports. CA-SEN: What’s going on with that anti-Semitic California candidate? FL-GOV: Richard Corcoran is dropping out, setting up a two-man race between Adam Putnam and Ron DeSantis. MD-GOV: Democratic gubernatorial candidate Kevin Kamenetz has died just weeks before the primary. MI-GOV: The Detroit Free Press profiles Shri Thanedar. MO-GOV: The name of the woman at the center of the Eric Greitens trial will be used in court. MS-SEN: Robert DeNiro and Alec Baldwin are raising money for a Democrat trying to unseat Roger Wicker. NY-GOV: Andrew Cuomo has appointed a special prosecutor to investigate Eric Schneiderman. TN-SEN: The Wall Street Journal notes that the Bredesen-vs.-Blackburn race is emerging as a bellwether. TX-GOV: The Texas Tribune traces how Andrew White came around to politics. WI-SEN: A group of Democratic veterans is calling for Kevin Nicholson to apologize for his controversial remarks about military vets who support Dems. WV-SEN: Don Blankenship’s defeat may have shattered Democrats’ dreams of taking back the Senate, POLITICO writes. Trump called Blankenship after his loss. Trump has welcomed three Americans freed from North Korea — and praised Kim Jong Un. The Washington Post asks if Trump’s efforts at foreign policy victories can mitigate the damage of his personal scandals. The Washington Post looks at how Michael Cohen convinced companies to pay him millions for access to Trump. Cohen says Michael Avenatti released records associated with other people who share his name. Europe is struggling to protect its interests after again being humiliated by Trump, writes the New York Times. John McCain is opposing Gina Haspel’s nomination to lead the CIA. The New York Times looks at what’s happening inside Eric Schneiderman’s downfall. Trump says he’ll curb drug prices. The Wall Street Journal looks at the pros and cons of the plan.